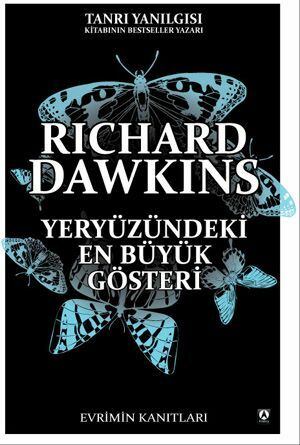 1) We (a team of 4 translators) translated Richard Dawkins' latest book "The Greatest Show On Earth" from English to Turkish and it was finally published in March. We have been receiving many many good comments about how great the translation turned out. Very proud of this! 2) As "Hard-workers for Evolution" we applied to European Society of Evolutionary Biology's (ESEB) public outreach fund and were granted the fund for our proposal! 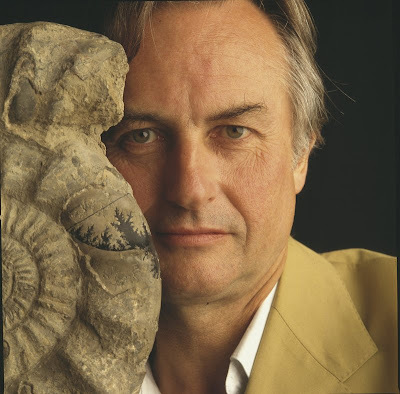 This will be the first time our organization will have real funding for public education of evolution in Turkey. Feels great that our efforts are recognized by ESEB. The most curious fact is the perfect gradation in the size of the beaks in the different species of Geospiza, from one as large as that of a hawfinch to that of a chaffinch, and (if Mr. Gould is right in including his sub-group, Certhidea, in the main group) even to that of a warbler. The largest beak in the genus Geospiza is shown in Fig. 1, and the smallest in Fig. 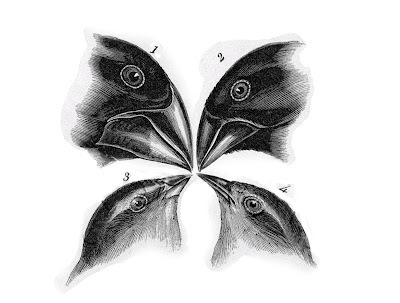 3; but instead of there being only one intermediate species, with a beak of the size shown in Fig. 2, there are no less than six species with insensibly graduated beaks. The beak of the sub-group Certhidea, is shown in Fig. 4. The beak of Cactornis is somewhat like that of a starling, and that of the fourth subgroup, Camarhynchus, is slightly parrot-shaped. Seeing this gradation and diversity of structure in one small, intimately related group of birds, one might really fancy that from an original paucity of birds in this archipelago, one species had been taken and modified for different ends. After hearing that one of the professors in our department got a tattoo, I finally gathered enough courage to get one myself. 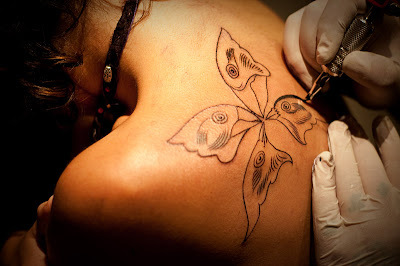 I always wanted a nerdy, science tattoo, but I also wanted it to look esthetically beautiful. 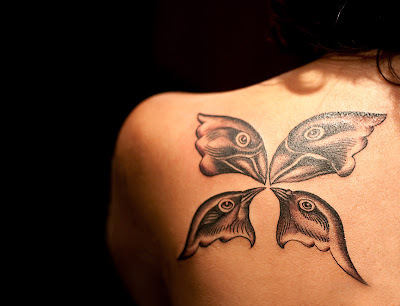 I quickly decided on Darwin's finches while chatting with my friend Tümay and told my husband about the idea. He loved it but said perhaps it will be better if I arrange them by flipping the two on the left, because the tattoo would not look that nice if I got it exactly the same as the figure in Darwin's book. So, I did it and when arranged that way (beaks pointing to a center), it looked like a butterfly, which added a nice surprise to the tattoo. -Look, you know that I will not be able to make the details here (pointing the birds' feathers and eyes) like they are in this picture. -Yes, that is completely fine, I just want it to look as close to the original as possible, so that people can tell they are Darwin's finches. I am so glad I trust the artist! He did a wonderful wonderful wonderful job. Such a fine taste he has! But as if these are not good enough reasons, on the night of the day I decided to get this tattoo, I started translating the Chapter 9 of Richard Dawkins' last book The Greatest Show On Earth. (Right now, I am one of the 4 translators who collectively translated this book into Turkish, and the book will be published by Kuzey Yayinlari very soon, needless to say, we are very excited about it). I just loved the fact that, Dawkins quoted the passage (above), where Darwin talks about Galapagos finches, in Chapter 9! 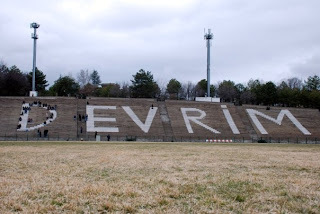 In Middle East Technical University (METU), one of the most prestigious universities in Turkey, there is a stadium, and on the concrete seats of this stadium there is a giant print that says: DEVRIM (means “revolution” in Turkish). According to the urban legend, this was written by a group of revolutionist students in 1968 with a formula they developed together with chemistry students, and this was such a formula that, no other paint could cover this white paint. All the attempts of deleting it, painting on it by the officials in the years that followed proved to be useless. Obviously, the chemistry students knew what they were doing. So the word “revolution” stayed on, reflecting the revolutionist spirit of this university for decades*. Yesterday, protesting the recent censorship of Darwin cover by the Turkish national science council of Turkey (TUBITAK), students and faculty at METU got together on the letter “D”. They called this protest “Censoring the censorship”. Because, when you remove “D” from the word “DEVRIM” you are left with “EVRIM”, which means “EVOLUTION” in Turkish. *Now one of the symbols of METU, the DEVRIM print was repainted in 2008, celebrating its 40th anniversary. Pictures of this event are here.